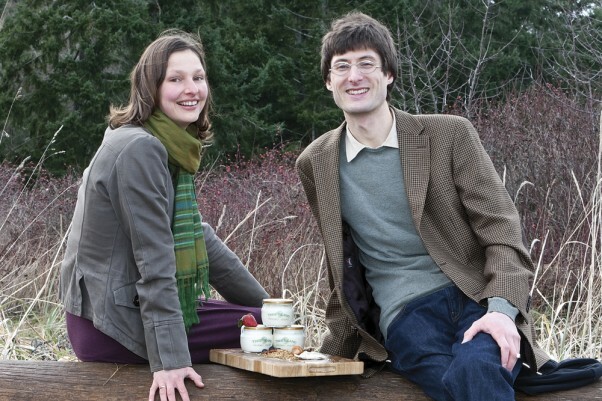 Local couple set to open Vancouver Island’s first artisan yogurt plant this spring. Survivors of the 1980s aerobics craze are likely to tell you being a healthy, order fit woman is a challenge. Not only were the high-impact classes of yesteryear hard on the body, they came with an image of how the female body should look and move that most women just couldn’t keep up with (and were often discouraged by). Jane Fonda and Olivia Newton-John, anyone? local farmers and producers work hard to keep the tradition of locally grown food alive. The Valley is home to many farmers offering a variety of food basics. There is also a growing sector of specialty producers supplying artisan products from cheese to wine using the agricultural wealth of the Valley. Scott DiGuistini and Merissa Myles will join that group of specialty producers in April when they open Tree Island Gourmet Yogurt, shop the first artisan yogurt plant on Vancouver Island. They recently acquired property on the Island Highway in Royston and are waiting for the formal paperwork to be processed and their dairy licence to be issued before beginning renovations to turn the property’s pre-existing building into a new dairy plant. The wait is the latest step in an entrepreneurial dream that has taken the pair down an unexpected path into yogurt making. DiGuistini and Myles’s story is not that different from a lot of young families in the Comox Valley. They were based in Vancouver—DiGuistini as a PhD student in microbiology at the University of British Columbia, Myles as a development manager with the YWCA—when their first child was born four years ago. The changes that inevitably come with starting a family kicked off a conversation about what they wanted to do as a family and what their priorities were. They agreed they wanted to experience life outside of the city, and to start a business. Where to live, and what the business would be, were up in the air. Only after DiGuistini submitted his dissertation for defence, however, were they able to hit the road and explore different communities in BC. “We decided the Comox Valley was the place we wanted to try and live,” says DiGuistini. So they bought a home in Royston and made the move. Both were still working their old jobs, though. DiGuistini’s dissertation in genome sequencing earned him an award and opened the door to job opportunities in Canada and abroad. Myles chose to telecommute before taking a maternity leave with the couple’s second child. For DiGuistini, however, the science just wasn’t working. “It just wasn’t in line with our values,” he says. Much of the reason for moving to the Valley was the community’s artisan vibe and growing culture of sustainability. And work in biotechnology—even in the field of biofuels—just didn’t feel right. Instead a trip to France to explore a job opportunity for DiGuistini got them thinking about yogurt. But not just any kind of yogurt—the sort of artisan dairy that is readily available in France. “We saw a lot of dairy products in France, and tasted some amazing yogurt,” says Myles. “The passion was to share the French experience using high quality ingredients and craftsmanship that is not available in Canada using the typical industrial process”. In the end, DiGuistini turned down the job offer and instead decided yogurt making was the business idea they had talked about. “We decided it was an exciting opportunity and an interesting family experiment,” says DiGuistini. “It was a major life decision, because we were at the point of how we want to raise our children, and what experiences we want to have with them as kids,” adds Myles. With that, Tree Island Gourmet Yogurt was born. DiGuistini took his skills in microbiology to the kitchen, experimenting with ingredients and techniques in yogurt making. The result was two product lines: Whole Milk (with cream on top) and Mediterranean. The first uses farm fresh non-homogenized milk from pastured cows. It is prepared without industrial thickeners, powders or artificial flavors, and comes in three flavors: Plain, Vancouver Island Honey, and Vanilla Bean, with plans for seasonable flavors in the works. Each container has a layer of golden cream on top that can be stirred in, scooped off, or eaten off the top. The second is thicker yoghurt made in the traditional style of Mediterranean and Middle Eastern yogurts (hence the name “Mediterranean”) where the yogurt is fermented in a large vat and has the whey strained out afterwards. It is prepared without added cream or gelatin, and comes in Plain Jane, Royal Honey and Silk Road. Both are available in 500 ml and 1.5 kg sizes. While experimenting, DiGuistini also completed the requirements for becoming a Certified Dairy Processor, and completed course work in cultured dairy at Cornell University in the food science department. That left finding a location for making the yogurt. And a home kitchen would not suffice. In addition to a home delivery service, Tree Island Gourmet Yogurt will be available this spring at specialty stores and markets. “You need to be a licensed dairy processor and your building needs a lot of things for public health and safety reasons that go beyond that of an industrial kitchen,” explains Myles. They found a willing partner in Hilary’s Artisan Cheese in Cowichan Bay. Hilary’s is a like-minded cheese-making shop (they produce high quality cheeses using local cow and goat milk) with a certified dairy processing plant able to accommodate small-batch yogurt making. With product in hand, DiGuistini and Myles were able to debut Tree Island Gourmet Yogurt with family and friends. The experience gave them the confidence to move forward filling a need with the locally minded, health conscious consumer. However, there were immediate limitations on what Tree Island was trying to do—bring locally grown and produced artisan yogurt to market. DiGuistini and Myles wanted local organic milk, but there aren’t any producers of organic milk on Vancouver Island. Likewise, no farmer would make the time-consuming (and often costly) switch to organic production unless Tree Island could guarantee a ready market. That would mean buying up to 7,000 litres of milk per week and turning it into yogurt. And there wasn’t a dairy plant on Vancouver Island able to make that much specialty yogurt. Finally, even if they could make that much yogurt, where could they sell such large quantities? A change from small-batch processing and marketing to large-scale artisan production and distribution meant finding space on the already crowded grocery store shelves and educating consumers. “We began with the vision to create BC’s best tasting yogurt,” says Myles. “And we’re focused on making a fresh, non-industrial processed milk product.” That focus, though, is radically different from the typical yogurt selection available in the average dairy aisle, which features established brands produced and marketing on an industrial scale. And a non-industrial product costs more, simply because of how it’s prepared. DiGuistini and Myles stepped back from small-batch yogurt making to re-evaluate their situation. On the one hand, they were committed personally and professionally to the organic food movement and its goals of local food security, direct connections with producers and processors, and peak freshness. On the other hand, they were admirers of larger-scale organic producers like Vancouver’s Happy Planet and the American Stonyfield Farm. DiGuistini decided the best solution was to build their own plant, and be the change they wanted to make. The answer, of course, is a lot harder than they thought. Licensing is complicated, start-up costs significant, and sourcing local materials a challenge. However, the effort has already created the sort of opportunities DiGustini and Myles are looking for. A Valley dairy farmer will be providing the milk for their yogurt, while others have expressed interest in participating. Likewise, Tree Island intends to stay small-batch processing by offering co-packing opportunities to other small dairies. That means offering other small and specialty dairies the opportunity to use the Tree Island plant to expand their own product lines. For example, Snap Dragon Dairy, the Fanny Bay micro goat dairy, is interested in using the Tree Island plant to produce goat milk ice cream. In fact, opportunity and capacity is what the Tree Island plant is all about. The planned renovations will be done to meet immediate production needs, but include long-term plans for growth and expansion. “We’re designing the plan around a continued process of evolving,” says DiGuistini. “We want to let the plant evolve with the company.” And in doing so, create a new market for locally produced, artisan dairy products on Vancouver Island. That just leaves one question. 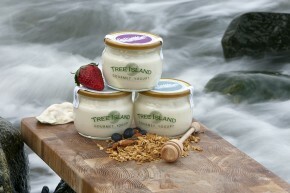 How do Valley residents get their hands on Tree Island Gourmet Yogurt, once production starts? “At first, we’re going to be selling in specialty grocery stores and non-traditional channels,” says DiGuistini. That includes farmers markets, local shops like Royston Roasting, and a home delivery service. For more information on Tree Island Gourmet Yogurt, or to inquire about their delivery service, go to www.treeislandyogurt.com.